Last week I shared a bit of my story, of what it was like to have to figure out how to pay myself once I quit my dayjob. But I left out the messy middle. The part where I had to take apart my whole system of profit and look at it piece by piece. When I first started selling yarn, I did what most of us do, I looked around and priced my work according to what else was out there. But it soon became clear that I could barely afford the skein of yarn I was dyeing at that price. I had to buy in bulk, at wholesale prices in order to have ANY kind of margin. But then, I had to look beyond the expense of that particular skein (also called Cost of Goods Sold) into my overhead: paper, ink, dyes, time, and figure out how that was going to get covered. But I can only raise my price so much! But I can only reduce my expenses so much! And this is where the exploring breaks down, because you just know there's nothing else you can do so you better stop looking at it before you discover something really awful (maybe you shouldn't have a business, maybe you'll never be a success, maybe this is crazy). Honey, I know. I know that looking at these numbers brings up all kinds of panic. And I know that you're afraid that there's nothing you can do to make it work. I know because when I got to this point of my numbers-crunching I freaked out. I wanted to stop looking and just hope that the math would magically resolve itself if I just worked harder. But it didn't. (And I gave that magic solution a good long time to show up.) What did resolve it was looking at other options. Revisiting the numbers and figuring out what else it told me. Just like with your marketing: explore what has worked and build from there. So now I also know that there are lots of things you can do to make it work. You can introduce a new product, you can try a new income stream, you can shift your focus a bit. There are a zillion things you can do to make it work, and none of them involve giving up. These zillion things are what we're going to explore in Pay Yourself. We'll find out what's not working, sure, but then we'll focus on what is working and build more profit from there. 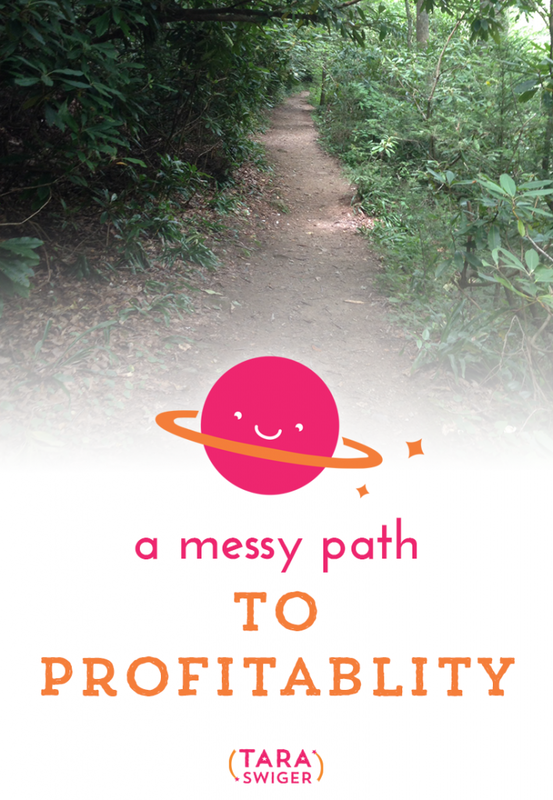 What has your path to profitability been like? What have you learned? What are you afraid to look at?